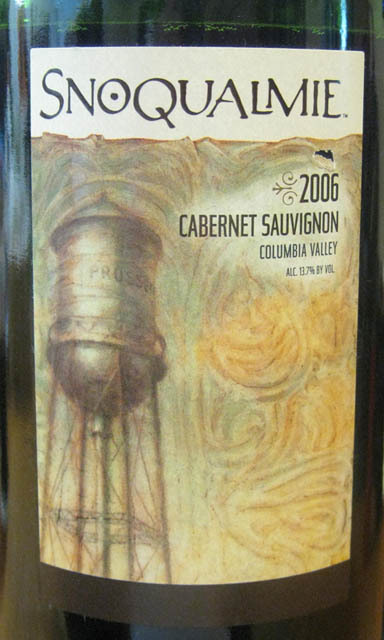 Winemaker Snoqualmie of Paterson, Columbia Valley, Washington gives recognition to water towers with its 2006 cabernet sauvignon. The artwork shows an iconic 4-legged tower, with town name Prussia (? ), set against a swirling background, reminiscent of Van Gogh or Degas. The label is overprinted with clear varnish echoing the swirling of the background beneath. Click on the image to get a larger view. 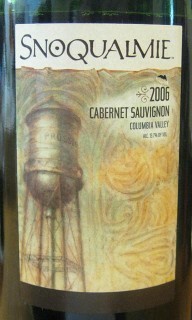 The World’s Tallest Water Sphere site applauds this fine wine and the excellent artwork of the bottle. Perhaps someday there will be a wine featuring the WTWS on the label. This entry was posted on Sunday, August 12th, 2012 at 3:19 pm	and is filed under Art, Competitors. You can follow any responses to this entry through the RSS 2.0 feed. Both comments and pings are currently closed.